Far to the east of the Iron Kingdoms lies the treacherous lanf where the enduring Skorne have built their empire. 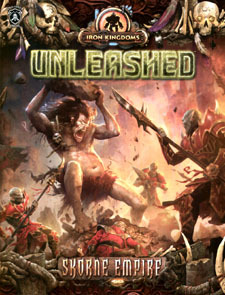 Iron Kingdoms Unleashed: Skorne Empire explores the scorching expanse of eastern Immoren, where survival means embracing the brutality and lethality of the punishing environment. Assume the warrior code of hoksune and adventure through eastern Immoren as a Skorne, mastering the powers of pain and deat5h ro thrive in a land as dangerous as its denizens! Journey far beyond the boundaries of the Iron Kingdoms with this essential full-colour guide to the Skorne Empire, eastern Immoren, and its inhabitants. Explore Halaak, Malphas, and the other major cities of the empire. Experience life as a skorne with over a dozen new careers, new gear and weapons, and new adventuring companies. Create your character with the new cast system, granting unique benefits that represent your place in skorns society. Battle all new beasts native to the unforgiving wilds of the east, such as subterranean razor worms, hulking Cyclops and the monstrous desert hydra. Wield the power of the empire's warbeasts and new spells unique to Extollers, Mortitheurges, and Skorne Warlocks.